Batcave Toy Room - Better Living Through Toy Collecting: A Stormtrooper That Is Black? How Dare They? A Stormtrooper That Is Black? How Dare They? You know...You know what I've noticed? Nobody panics when people get what they expected. Even if what they expected has been done before. If, tomorrow, pictures get leaked to the press, of like, the Millennium Falcon, or X-Wing Fighters and then we seem them in the teaser trailer for Star Wars: The Force Awakens, nobody panics, because it's what they expected. But introduce a Black Stormtrooper or new lightsaber design, well then everyone losses their minds! Besides having peek at what some feel is an impractical lightsaber, our first glimpse at the next Star Wars movie gave us a look at a Black Stormtrooper, which has caused a stir throughout the Internet. Mostly negative from what I have been experiencing. As most Star Wars Fans know, at least the diehards, Clone Troopers were no longer enlisted by the Empire due to their rapid aging and the Empire had then began enlisting loyal civilians into the Empire's Imperial Forces. Even Han Solo had been in the Imperial Navy at one time. So, it is conceivable that there were Stormtroopers that were black men. Even though we had never seen what was behind the helmets. In response to all the negative reactions actor John Boyega, the Stormtrooper in the teasers opening, responded to all the rumblings via Instagram with his apprection to those supporting his role in the new film, while also addressing the nay sayers. Was the Episode VII teaser trailer exactly what I expected? No, and if it was, would it have been as fun to watch? Probably not. I did expect to see some glimpses of the original cast of Luke, Han, Leia, but the fact that the teaser opened with a Black Stormtrooper, I asked myself, "Who's that guy? Is J.J. Abrams going to give us some humanity to the Stormtroopers?" When I saw the new lightsaber design, I didn't say, "Wow! That's the stupidest thing I have every scene." My first thought was, "How does that work?" Part of my being a Geek keeps my childlike wonder and imagination in check. One of the reasons I loved seeing this trailer was it gave me the exact same feelings that I had when the original trilogies trailers were released and kept me wondering what was going to happen until I was finally able to see the movie. Why not let it do just that gang? Let's keep the discussions going, but with that same childlike wonder. A Stormtrooper that is black. A new lightsaber design. Who would have thought these two things would ever break the Internet? I prefer to let positive discussions about the new film do that. Star Wars: The Force Awakens opens in theaters December 18, 2015. 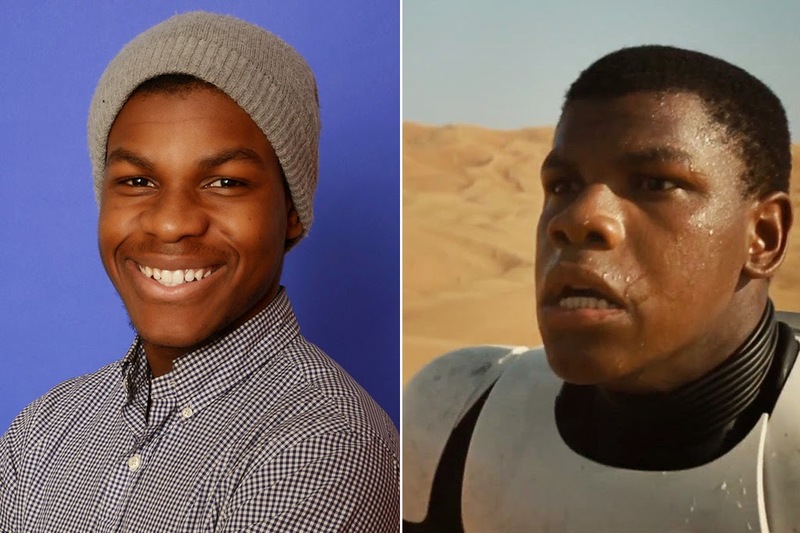 Going by the look on Boyega's face, I'm assuming he's either going to be in disguise, or a soon to be ex-Stormtrooper. Perhaps he's come to the realization that he's working for a bunch of jerks. The more I look at that lightsaber design, the more I like it. I love the hilt design, and the flame-like blades. It just looks nasty and dangerous. It really is sad that some fans seem so cynical these days. I mean, this is the first Star Wars teaser in over a decade, shouldn't that be something to be happy about? I know it was enough to break me out of my cynical shell, and get me excited about Star Wars again. I think he has either been running through the desert or maybe fell off a transport. He may also be trying to get a message to Daisy Ridley's character. Just like R2 and 3PO were attempting to get Leia's message to Obi-Wan. I like the fact that the lightsaber isn't the same old thing. Weapons, vehicles, etc. have always been modified by their owners throughout the trilogies. For whatever reason many fans just can't seem to get back the same feelings they had when the original trilogy was released. I am not sure what folks want, but I enjoyed the more recent trilogy as well. With some you would think they were making a sequel to the Star Wars Holiday Special. I will admit, I lost a little love when I saw the newer trilogy, but that doesn't mean I can't still enjoy the original movies. Actually, I guess it does since I can't find non-special editions anywhere.. I didn't mind the lightsaber. We have seen that in trailers before. New lightsabers I mean. I wouldn't have even noticed the Stormtrooper if it were say, in the middle of the trailer...But it just seemed to smack of "Hey we have a black guy in the movie" with it being the first shot we see. I will discuss my comments on my controversial Thursday post. I am looking forward to see the functionality of the lightsaber. I think they took scenes that had characters dramatically running to somewhere or something and it was just one of those scenes that fit what they were trying to relay in the trailer. Looking forward to your post on Thursday. I mentioned over on Chris' blog that I think they might have chosen that initial scene to make it very clear that this isn't your average clone army - us die-hards do know about the non-clone troopers, but your average movie goer might still be thinking they are all clones. Regardless, I too want to know, is he good or bad, and what is he running from? I also mentioned that the light saber comes across as almost home-made. As if the Sith who made it didn't follow the normal path of apprenticeship. But these are just my speculations, which are fun to do when you have nothing but a teaser to work from. I think the teaser did a great job of showing nothing while showing something, and it got my blood pumping when I saw the X-Wings and especially the Millenium Falcon! The fact that there are idiots out there taken aback (or worse) by a black stormtrooper just proves there are idiots everywhere, and sometimes the internet gives them way too large a forum to share their stupidity. I figured most would catch that they were no longer clones if they had seen the Special Editions since Boba Fett's voice was the only one that was dubbed over with Jango Fett's voice. All the Stormtroopers kept their original voices. Other than Luke, it will be interesting to see who's around to teach the art of lightsaber construction. I was hoping to see the original cast in the teaser, but I guess X-Wings and the Falcon are part the original cast. Love the new radar on the Falcon too. Yeah, not sure why that stuck out like a sore thumb to some people. but I guess people see what they want to see. I'm curious to see if the look of the lightsaber's blade is an artistic choice, or like Eric said, due to being built by someone who doesn't exactly follow the same path as everyone else. We don't get to see much, but I think there's a lot to be excited about with the team behind these movies.